Green Survival – as a landscape and horticultural service provider was founded by Denis Fitzpatrick in 1979. Since then Green Survival’s qualified staff have delivered many quality landscape and horticultural services to a wide range of clients throughout Brisbane and South East Queensland. The quality has in fact been recognized 18 times by the peak body for landscape in Queensland, presenting Green Survival with 18 awards for excellence. Some of these projects are featured in our gallery. Green Survival has also provided excellent training for many professionals now operating their own landscape business throughout South East Queensland. 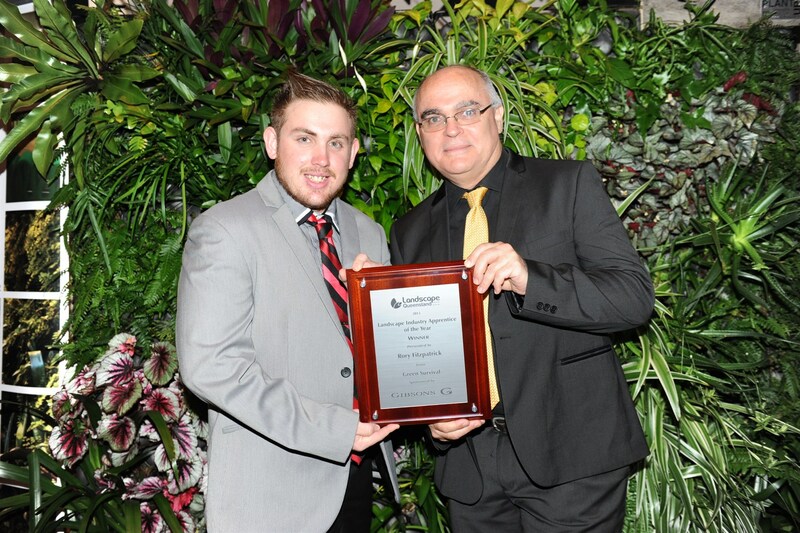 In fact this was recognized in 2013 by one its employees, Rory Fitzpatrick, being awarded the top apprenticeship award for landscape in Queensland. Green Survival led by Denis Fitzpatrick has a well established working relationship with engineers, architects and builders. Denis is a tertiary qualified landscape professional who has been awarded for his long relationship with the peak body for landscape excellence in Queensland. Landscape Queensland was formerly Queensland Association of Landscape Industries of which he is a founding member and served many years as president and on the board. He was awarded one of the very few life memberships and recognized by the Queensland Government for his work to professionalise the landscape industry in Queensland and Australia with the Build Environment Award. His overall knowledge of landscape construction is so well recognized he is often engaged to inspect and write reports about landscape construction for use in courts of law or for awards committees interstate. The staff of Green Survival are regularly trained and informed of the most up to date materials and methods for landscape construction for both hard and soft elements of installation. They regularly attend in service training and field days and network with other professionals in the industry. So, we at Green Survival are confident to solve landscape problems efficiently, cost effectively and in the most environmentally sustainable way, so you the client can enjoy your newly created landscape for many years. Green Survival and its team of professional installers and maintenance specialists has created and maintained a plethora of outstanding, livable and sustainable environments, whether they be $5000 to $500,000 for clients in the domestic, commercial and municipal market. Contact Green Survival to not only solve your landscape problems but provide you with a pleasing new environment. Almost four decades ago Denis Fitzpatrick founded Green Survival. The year Dennis Fitzpatrick became president of the Queensland Association of Landscape Industries now known as Landscape Queensland. Our quality has in fact been recognized 18 times by the peak body for landscape in Queensland, presenting Green Survival with 18 awards for excellence. We are very proud of this achievement. source for the highest quality and outstanding landscaping services in Brisbane. These following awards represent how our attention to detail is greatly appreciated. 1997 - Landscaping Maintenance. for work at Cnr. Whitmore and Seven Oaks Street. Taringa Irrigation in Landscaping. for work at St Joachim's School, Holland Park.